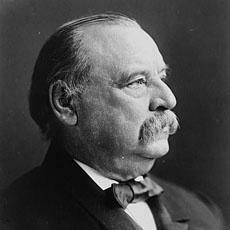 Grover Cleveland was elected president of the United States in eighteen eighty-four. He was the first Democratic Party candidate to win a presidential election in almost twenty-eight years. Grover Cleveland defeated James Blaine, a senator from the Republican Party. The election was very close. Many Republicans did not vote for their own candidate. They voted for Cleveland instead. They believed he was honest and that Blaine was not. This week in our series, Kay Gallant and Harry Monroe tell us about the presidency of Grover Cleveland. KAY GALLANT: Cleveland began his administration by announcing that he would reduce waste in the government. He would make government more like business. He said he would support reforms to let ability -- not politics -- decide who would get government jobs. Democratic Party leaders were quick to protest. They explained to Cleveland that the party owed jobs to those who had worked for his victory. Cleveland had to compromise. He permitted about eighty thousand government jobs to be taken from Republicans and given to Democrats. This left twelve thousand jobs. These would be given to people who did the best on government examinations. Cleveland's decision angered Republican reformers who had voted for him. They accused him of surrendering to the leaders of the Democratic Party. HARRY MONROE: On other issues, however, Cleveland refused to compromise. He opposed government economic aid to any industrial group. He vetoed a bill giving aid to farmers whose crops had failed. And he vetoed another bill giving more money to men who had served as soldiers during America's civil war of the eighteen sixties. The president also showed his independence by investigating gifts of public land that the government had made to the railroad, wood and cattle industries. He found that many of these land grants were made illegally. He got back much of the land. He opened it to settlers. KAY GALLANT: President Cleveland signed into law two bills he believed would improve government. One was the Electoral Count Act. It set new rules for counting the electoral votes of the states. It would prevent future disputes over presidential elections, like the one in eighteen seventy-six. The other bill changed the list of officials who could become president, if the president and vice president died or were removed from office. First on the list -- after the vice president -- was the secretary of state. Congress changed this law again in nineteen forty-seven. And there have been four amendments since then. Today, the speaker of the House of Representatives would succeed the vice president as president. Then would come the president pro tempore of the Senate. And then, the secretary of state. HARRY MONROE: Grover Cleveland approved a bill giving the government control over the cost of railroad transportation. The bill was called the Interstate Commerce Act. It limited the amount of money railroads could demand from people who needed to travel or transport their goods. The law established the idea that the government could control industries, when necessary, for the public good. President Cleveland also was concerned about a growing number of labor disputes that took place in the United States in the late eighteen hundreds. He proposed that Congress create a labor committee to help settle the disputes. KAY GALLANT: Congress failed to act on this proposal. But its lack of action did not stop the rise of a labor organization that had been formed a few years earlier. The group soon would become the most important labor union in the United States. It was the American Federation of Labor, or A.F.L. Led by Samuel Gompers, the A.F.L. was different from earlier labor groups. It did not try to put all workers into one union. Instead, it tied together a number of different unions and gave them general leadership. HARRY MONROE: The A.F.L. was different in other ways. It did not oppose the economic system of capitalism. It said only that labor should get more of the earnings of capitalism. The A.F.L. also opposed extremists who used labor protests to change the social system. What the A.F.L. called for were things workers wanted immediately. Higher wages. A shorter work day. Better working conditions. One of its first demands was an eight-hour work day. This demand led to a number of strikes and protests throughout the country. KAY GALLANT: The most serious incident took place in Chicago's Haymarket Square. More than one thousand union supporters went to a meeting there organized by an extremist. They stood calmly and listened to speeches. Just before the meeting ended, someone threw a bomb into a group of policemen. The bomb exploded with a blinding flash. Seven policemen were killed. The other policemen began shooting at the crowd. Some people in the crowd fired back. When it was all over, ten persons had been shot to death. Fifty others were hurt. The incident set off a wave of fear and anger across the country. The public demanded action against union extremists. 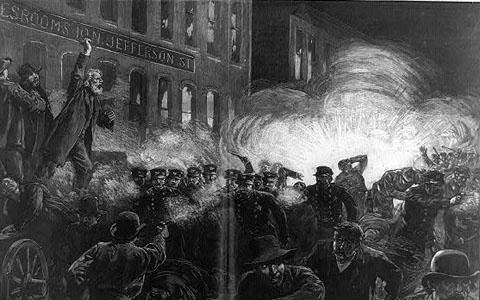 The Haymarket Square violence slowed the growth of organized labor in the United States for many years. It would be some time before labor became a powerful force in national events. HARRY MONROE: In the spring of eighteen eighty-six, President Cleveland announced that he was to be married. The ceremony took place in the White House. A few months later, President Cleveland and the First Lady went to New York City for the official ceremony welcoming the Statue of Liberty. The statue was a gift to the people of the United States from the people of France. It represented the alliance between their two countries during America's war for independence from Britain. The statue was the creation of French artist Frederic-Auguste Bartholdi. He decided to make a statue that would represent freedom -- a Statue of Liberty. He said it should stand on an island in New York harbor. There, he said, it would welcome all who came to America through that gateway. KAY GALLANT: Bartholdi decided to make a copper statue in the image of a woman -- Lady Liberty. High above her head, she would hold a torch of freedom to light the world. The statue's face was the face of Bartholdi's mother. The artist asked French engineer Gustave Eiffel to build a steel support to hold the heavy statue. Eiffel was the man who later built the Eiffel Tower in Paris. The statue was built in France. Then the pieces were sent across the Atlantic Ocean. It was rebuilt in New York. 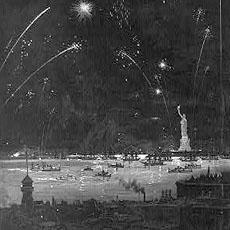 HARRY MONROE: Grover Cleveland and his wife were not the only Americans to attend the Statue of Liberty ceremonies in eighteen eighty-six. Thousands of people crowded onto ships in the harbor to watch the great event. Thousands of others crowded the shorelines around the harbor. Everyone cheered wildly when a signal was given and a huge cloth fell from the statue. Lady Liberty stood holding her torch high for freedom. Under her feet were the broken chains of tyranny. Below the statue was a poem. It called to the poor and oppressed people of the world. It told them to come to America to find a land of hope and freedom. HARRY MONROE: The Statue of Liberty was a great success. It was one of the great engineering wonders of its time. And it filled Americans with pride in their tradition of freedom and openness to people from all lands. Our program was written by Frank Beardsley. The narrators were Kay Gallant and Harry Monroe. You can find our series online with transcripts, MP3s, podcasts and images at www.unsv.com. You can also follow us on Facebook and Twitter at VOA Learning English. Join us again next week for THE MAKING OF A NATION -- an American history series in VOA Special English. 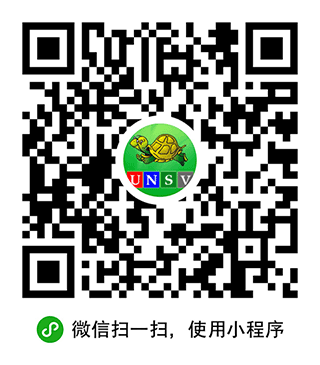 I have to admit UNSV is the best website to learn VOA English. By listening to this programme, I have improved my English.